January 22, 2014 - Lenovo has made some impressive internal upgrades to their flagship IdeaCentre A730 all-in-one system while still managing to keep the system quite affordable. The new 2560x1440 display is the key improvement that puts it on equal footing with its primary competitors but the fact that they can include Blu-ray and dedicated graphics for the price is impressive. Even with its stylish design and improved display, the A730 still retains a major design flaw in its slow speed hard drive that hampers performance. Many savvy buyers are using their savings to then buy an SSD kit to replace the drive to correct this problem but it does take some technical skill. 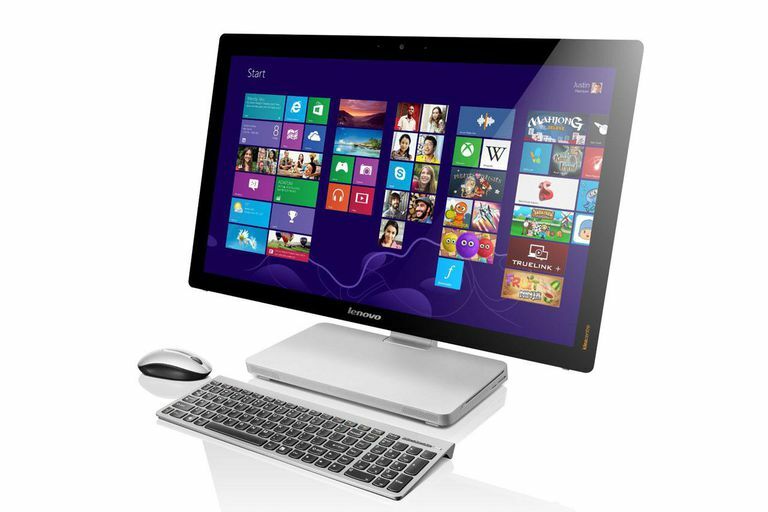 Lenovo's IdeaCentre A730 is pretty much identical in appearance to the previous IdeaCentre A720 model. The system features a large 27-inch display with a modestly thin display frame and a large metal base that houses the primary components of the computer. The hinge design allows the screen to be folded near flat which is very helpful for those that like to use the touchscreen frequently. While the exterior of the system has not changed much, the internal aspects have changed dramatically. The IdeaCentra A730 still uses mobile processors like the past version but they have been updated to the new Haswell-based Intel Core i7-4700MQ quad-core processor. This provides a very small boost in performance but a major increase in efficiency and heat. In terms of processing power, it should provide enough performance for the majority of uses. It can even be used with demanding tasks such as desktop video work but it should be noted that it will still fall behind a system using a quad-core Intel Core i5 desktop processor. The processor is matched up with 8GB of DDR3 memory which provides a smooth overall experience with Windows. The one aspect that was not really upgraded at all is the storage. The system still relies on traditional hard drives. It ships with a one terabyte hard drive standard that provides a fair amount of storage space. The downside is that this drive spins at the 5400rpm spin rate that reduces the performance compared to drives that spin at the faster 7200rpm rate. There is an option for an upgraded model that features a solid state hybrid drive with 8GB of SSD cache. This will boost Windows boot speeds and frequently used files but it still is not as fast as a full solid state drive or one with a larger cache setup. If you do require additional space, there are four USB 3.0 ports for use with high-speed external storage drives. Three of them are in the back of the system to help hide cable clutter and one is on the left-hand side for easy access. Lenovo has not abandoned optical drives and even includes a Blu-ray combo so that the system can playback the high definition movie format or have the ability to record or play DVD and CD media. The display system for the IdeaCentre A730 also received an upgrade. Where the past model was only available with a 1920x1080 resolution screen, Lenovo now offers models for just a small fraction of a cost more that uses the 2560x1440 display resolution. In fact, we recommend against getting the lower resolution model at this point as the $100 upgrade cost is more than worth it. The screen offers a very bright picture with excellent color and contrast levels. It is still a capacitive touchscreen which is very responsive. As mentioned above, the stand offers a wide range of angles which make it easier to use. The graphics have also been upgraded to an NVIDIA GeForce GT 745M dedicated graphics processor. This does provide some 3D performance such that you can play some games at lower resolution and detail levels, it will still struggle with many games at the 1080p display resolutions. It does work well with a 1280x720. The dedicated processor does offer a wider range of acceleration for non-3D programs such as Photoshop or many distributed computing applications. List pricing for the IdeaCentre A730 is between $1800 and $2000. This is well above what people can actually find the systems priced at. Consumers can generally find the systems for between $1400 and $1600 depending upon the display resolution and hard drive installed. The most common price is $1500. Lenovo faces two primary competitors for the A730 in the Apple iMac 27-inch and the Dell XPS 27 Touch. Now Apple's system does not feature a touchscreen display but it does feature full desktop class processors and options for solid state or fusion drives that provide it with much faster performance which is beneficial for those looking at doing work like desktop video editing. Dell's XPS 27 Touch is much closer in terms of features. It uses a touchscreen display and also offers desktop-class processors for more performance but it does sacrifice the display angle adjustment abilities and ends up with a higher price tag if you include a similar dedicated graphics processor, faster storage and a Blu-ray drive making the Lenovo a better overall value.